Microsoft have included an Internet TV function to the October 22nd global launch of the new Windows 7 operating system to the Windows Media Center. The addition of Internet TV access now can transform your computer into a home entertainment hub when connected to a digital TV, narrowing the gap between movies and TV shows delivered from the Internet to the TV. Internet TV, a streaming media capability that could spell the end for expensive cable systems. Internet TV lets you stream video and audio programming directly into Windows 7 Media Center, without the hassles of going to myriad Web sites and downloading multiple players, said Microsoft rep Brian Yee, in an interview with Betanews at the Microsoft bash. Actually, Internet TV has been under development at Microsoft since way back in September of 2007. Netflix started showing up as a Media Center partner in January of this year, and was soon streaming some of movies into the Vista version. In May, Internet TV for Media Center officially entered beta 2. With today’s release of Windows 7, though, the feature finally leaves beta testing behind. In demos today after company CEO Steve Ballmer’s keynote, Microsoft showed Internet TV working together with Play To, a new function in Windows 7 that uses the DLNA 1.5 protocol to send streaming content from a PC to other home-networked devices. In a mocked up living room,” Yee clicked on icons in a Windows 7 enabled laptop to stream videos from services like Netflix, MSN, and sundry CBS Audience Network properties to an HDTV from LG and two D-Link digital photo frames. He also sent tunes streamed in from Microsoft’s Full Zune Podcast Library to a remote audio system a few feet further away. As for Netflix, Internet TV only works with those movies marked as streaming-enabled. The CBS Audience Network videos — consisting of current TV shows, CBS Classics, short clips, and “Web originals” — are available in the US only, whereas Sky Network content is available in the UK only, said Yee. “But we’re also really interested in Internet TV partnerships with other entertainment content providers,” he added. • CBS Audience Network: Featuring a variety of shows from CBS Primetime, Daytime, Extras, and TV Classics, including full-length episodes of current TV shows, CBS Classics TV shows, short clips, and Web originals. • Full Zune Video Podcast Library: Thousands of hours of entertainment with full TV episodes, webisodes, clips, and videos from providers including ABC News, CBS News, CNBC, CNET TV, Comedy Central, Current TV, The Discovery Channel, Fox, G4 TV, HBO, MSNBC, NBC, Showtime, and Revision 3, along with some of the best user-generated videos on the Web. Some video podcasts are also available in HD. • MSN and msnbc.com: Clips as well as full length episodes from TV shows such as Arrested Development, news and weather from MSNBC, editor picks and most popular videos, five day weather forecasts, news, video playlists, music videos, movie trailers and more. Well done Microsoft for releasing the internet tv addition quietly and without fanfare…Or did you just forget about that new feature? Internet TV stealing traditional couch potatoes. I don’t have the Windows Media Center on my laptop with operating system windows 7 now. 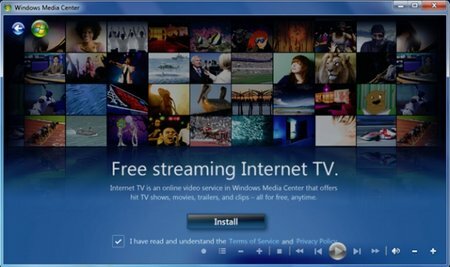 What and how do I download and install the internet tv in my windows media center now? Please get back to me on this issue, so I can know what to do to install the newer version of windows media center with internet tv, please. I like the idea of Internet TV provided by Microsoft in general, of those CBS TV features and all other collective large tv broadcasting stations, movies and tv drama shows, rather of all the features and collective other features of the Hollywood star interviews, news segments, discussions of the shows, etc. Computers must be the informaton center both educational and public relations of the motto, well advertiseed durig the 70’s and 80’s, just like guitar connected to electronic speakers, make better and louder sounds with electronical experiences called digital. All about written at least of all, telegram, telex, post office, fedex, etc. and order the documents and cards etc. corporational segments, bette than voice mail on the phone, all!